The Gazebo is all about elegance and style. This small roofed room has so many uses: entertainment, bbq eating area, lazing in spring, summer and autumn, breakfast area. A Gazebo can transform your garden into a work of art. We recommend building your Gazebo from timber and using colorbond or polycarbonate roofing. Polycarbonate roofing sheets will allowed filtered light to enter the Gazebo space. 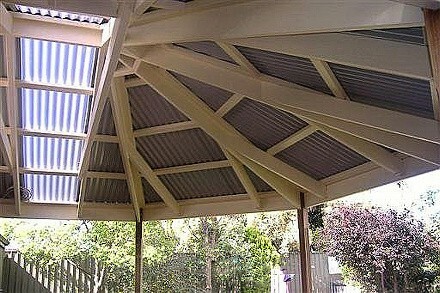 A carefull Gazebo design will introduce both Colorbond sheets and Polycarbonate sheets. Some Gazebos will benefit from having timber balustrades or lattice balustrades. 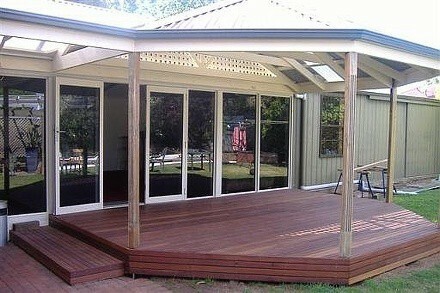 Timber decking will add a finishing touch to your Gazebo. We also offer gutters (which will be essential for larger Gazebos and a range of roof finials for that extra design touch. All gardens are different, so we can design a gazebo to suit you and your garden.